Using the AT9933 variable frequency PWM controller IC, can be designed a very simple and high efficiency LED lamp driver using a low-noise boost-buck topology.The AT9933 uses patent pending hysteretic current-mode control to regulate both the input and the output currents. This enables superior input surge immunity without the necessity for complex loop compensation. Input current control enables current limiting during startup, input under-voltage and output overload conditions. 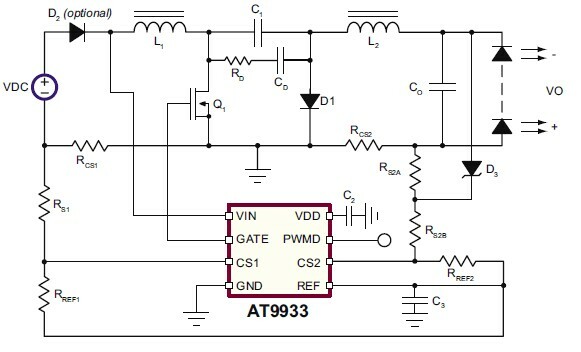 The AT9933 provides a low-frequency PWM dimming input that can accept an external control signal with a duty cycle of 0 - 100% and a high dimming ratio. This LED driver electronic project , require an input voltage range between 9 and 16 volts and will provide an 28 volt output at a maximum output current of 350 mA .The switching frequency of this electronic project is 350kHz . Values for components are : L1 = 82μH,L2 = 150μH,C1 = 0.22μF , RCS2 = 1.65Ω 1/4W, RREF2 = 10kΩ 1/8W, RS2A = 100Ω 1/8W,RS2B = 5.23kΩ 1/8W, RCS1 = 0.228Ω 1W, RREF1 = 10kΩ 1/8W,RS1 = 4.42kΩ 1/8W .